You earn more, you're better educated, you make most of the arts-consumption decisions — and men are such troglodytes anyway — so why not spruce up your relationship by veering from dinner-and-a-movie to dinner-and-a-play? Widows may be nervous about dating again, but they can joke about it, too. 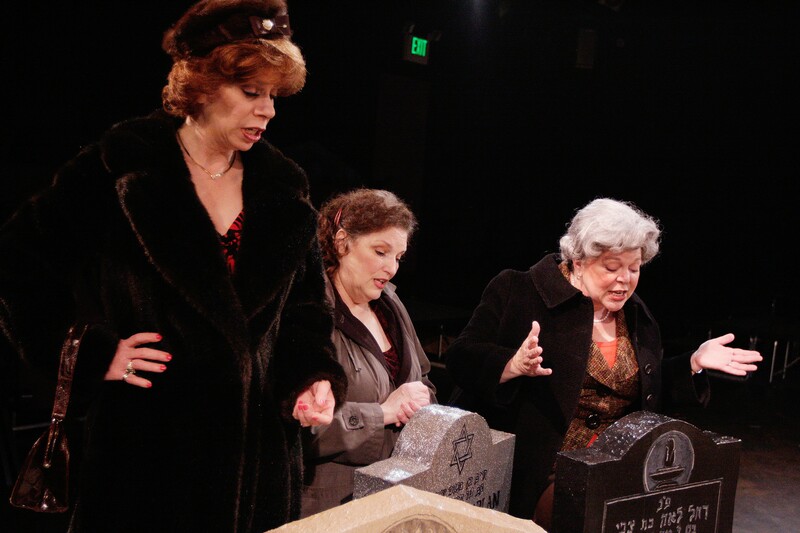 The Cemetery Club opens tomorrow night at the Civic. Both touching and funny, it shows what happens when three middle-aged women — and then a fourth — start competing for the affections of a nice widowed butcher. Fri-Sat at 7:30 pm, Sun at 2 pm; runs through Nov. 14. You're gonna love the va-va-voom mystery woman in the opening scene of The 39 Steps at Interplayers — and wait till you see the silliness of the "cops, conductors and underwear salesmen" scene. It's all a hilarious spoof of an old Hitchcock film. (Sneak in a hip flask and take a nip every time they make an allusion to one of Hitch's movies.) Thurs-Sat at 7:30 pm, Sun at 2 pm. Call 455-PLAY. Buddy is sold out for its final weekend at the Civic, but you can get on a waiting list. Little boys want adventures, but they want their blankeys, too. How I Became a Pirate is a musical based on an illustrated kids' book. Four shows this weekend: Sat-Sun at 1 pm and 4 pm, at the Masonic Center downtown. Call 328-4886. Romeo and Juliet features two tall Gonzaga basketball players wearing tights and a traditional but visceral staging by director Kevin Connell (the Jesuit priest who's principal at G-Prep); see our review next week. Fri-Sat at 7:30 pm and Sun at 2 pm (but tickets are scarce); closes on Halloween at 2 pm, at Gonzaga's Magnuson Theater (east end of College Hall). Once Upon a Mattress continues on Fri-Sat at 8 pm at Whitworth 's Cowles Auditorium. Call 777-3707. It's "The Princess and the Pea" set to music -- except this princess isn't about to put up with any stupid test-the-potential-bride tricks. NIC offers The Laramie Project, a docudrama about the town's reaction to the anti-gay torture-and-murder of Matthew Shepard — a play so powerfully written and frequently produced that it has spawned a 10-years-after theatrical sequel. (This is the original play, though.) Performances tonight, Friday, Saturday at 7:30 pm inside NIC's Boswell Hall in Coeur d'Alene. Call (208) 769-3220. And the price? Free. LUNCHES AND PUNCHES 6: Watch the dog fly!